Accurately sizing your solar power system is not as difficult as you may think. Knowing how many solar panels you will need as part of your solar array depends upon the amount of peak sun hours available per day and the actual energy consumption of your home. Also, what percentage of your home’s energy needs do you want to generate using your solar array. Photovoltaic solar panels come in a variety of different voltage and wattage sizes and are designed to supply energy to your home. Generally, solar panels are classified by their rated output power, which is given defined in WATTS. For example, 10 Watts peak power or 200 watts peak power. This standard wattage rating is the amount of power that a single solar panel can potentially produce in one peak hour of bright sunlight. One of the biggest technical challenges to overcome with all photovoltaic installations, regardless of configuration, is the correct sizing of the system to meet the demands of the household. The size of the photovoltaic system required varies from home to home as each homes energy usage and energy efficiency will be different. But determining the optimum number of panels and total wattage of your solar system on requires knowledge of your household usage and some simple maths. To help you overcome some of these challenges, we have put together an easy-to-follow, step-by-step guide that will assist you to easily size your photovoltaic system. The modern world relies heavily on the use of energy obtained from burning fossil fuels, and without this energy machines will not operate and electricity will not be generated. Electricity is needed for everything from powering the lights in our homes to running a high speed rail network across the globe. Our energy consumption and requirements have been increasing rapidly during the last 250 years following the advent of the industrial revolution. From the age of steam until today this rapid increase in the use of energy has created its own problems of supply and demand. This growing world energy demand has led to increased use of cheap fossil fuels such as coal, crude oil and natural gas, just to generate electricity and keep the lights on. Solar panels are typically sold by the peak watt. When the sun is at its strongest or peak intensity usually at midday on a clear day, it produces the equivalent of about 1000 watts per m2 of solar radiation directly onto the Earth’s surface. One hour of maximum, or 100% sunshine received by a solar panel equals one equivalent full sun hour. So if a solar panel is rated at say 100 Wp (peak watts) it would supply 100 watts of peak power at the brightest part of the day. If the average peak sun hours for a particular location is given as 4.5 hours, this means then that our solar panel will provide 450 watt-hours (4.5 hrs x 100 Wp) a day of peak electricity during the day. Obviously the sun shines longer than 4.5 hours a day. Climate data given for a particular location on the Earth’s surface would give the solar intensity data in terms of peak sun hours, so the suns intensity from sun rise to peak hours and back down to sunset throughout the day will be a percentage of the peak hours and therefore the power output from a photovoltaic cell will also be a percentage of the maximum during these times. For example, early in the morning a 100W solar panel may only be producing 25 watts, then midday it produces the full 100 watts, and in the afternoon only 25 or 30 watts again. So maximum power is only generated when the sun shines directly onto the solar panel. To determine the required overall power rating of a photovoltaic solar system required to power a home, the electrical energy needs in terms of watts per hour should first be evaluated. To work out your homes power requirements, you need to do some homework first. Everyone’s power consumption is different so by listing and adding together the appliances, lights and TV’s with their hourly power requirements in terms of their wattage you can easily arrive at the total watt-hours per day you home consumes and you may even find were you are wasting power as well. The final power rating of the solar system can then be calculated and sized, based on the portion of the homes electricity consumption to be supplied by the system. So for example, a system that is required to supply 100% solar electricity may be twice the size of a system designed to supply only 50% of the homes consumption. Then we can see that a photovoltaic system can be sized to provide either part or all of your homes electrical consumption. The only limitation is on physical size and cost. The ability of a photovoltaic solar system to produce free electrical energy is not unlimited. It is limited by the number of hours a day the sun shines and it is limited by the physical area available to install the solar panels. Accidentally leaving on a light bulb “ON” during the day can easily consume and waste unnecessary amounts of energy whether its free or not. Saving and reducing your homes energy needs by using energy-efficient light bulbs and appliances not only saves you money in reduced bills, but done correctly it can reduce the final size and cost of installing your new solar array system. Solar panels and arrays are designed to supply a certain amount of energy consumption. If the home exceeds the planned limits this additional energy will need to come from somewhere either from the utility grid costing you money, a backup generator or storage batteries. An energy-efficient home reduces the number of solar panels required making the installation of the system cheaper, less complicated and reducing its payback period. Reducing your consumption for one day with the aim of installing a small solar array is not the correct approach. Lowering your homes power consumption and power needs as much as possible is a long term challenge if you want to live “off-grid”. There are many hundreds of different size solar panels available to choose from ranging from small 20 watt panels to larger and heavier 250 watt panels at 12, 24 or 48 volts and all with their own set of advantages and disadvantages. The number and type of solar panels required to capture enough solar energy to support your electrical consumption plays an important role in the design, sizing, operating voltage and cost of your solar photovoltaic system. 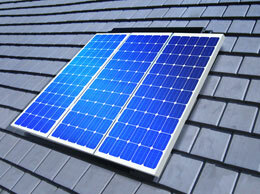 A typical solar panel is made up of a grid of individual solar cells. There are different types of solar cells to consider. Mono-crystalline silicon solar panels are the most efficient at converting the suns solar energy to free electricity, but they are also the most expensive. Poly-crystalline silicon panels are slightly less efficient than mono-crystalline types, but they tend to be cheaper since they are cheaper to produce. Finally, thin film solar panels are the least efficient of them all, but they are also the cheapest and readily available. Thin film solar panels are uniquely versatile as the silicon film is thin and flexible. Shop around the market to find the best panels and prices that suit your needs and budget. Now for the final part to estimate the size of your solar array. First you will need to divide the previously calculated total watt-hours by the peak sunlight hours. This should give you the total wattage of solar panels that you will need and then add a little extra to make up for the cloudy dull days. This value gives you the total number of solar panels we need to generate a given amount of Watt-hours (or kWh) for our home in your given location. For example if we need a 1000 watt system, then that’s 10 x 100 watt panels or 5 x 200 watt panels. Secondly, since the solar panels will be used to supply the home directly with free solar electricity via an inverter or to charge storage batteries, it is necessary to decide what the nominal DC voltage of the system will be. Depending upon the required battery storage and inverter sizing, the configuration of the solar panels may be connected in a series configuration, a parallel configuration or both. If you want year-round reliability, it’s generally best to use the lowest DC voltage and power rating possible to reduce potential breakdowns and to keep our solar electrical system running effortlessly and economically for years to come. The peak power rating of the individual solar panels you will be using can be found in the manufacturers specifications. But bear in mind that ALL the photovoltaic panels you choose MUST be the same type and from the same manufacturer as mixing and matching different panels will create problems and lower the arrays efficiency. So to summarise, sizing a solar array is not as difficult as you may think, but there are two important factors to consider first to make your life a little easier. 1. What is the average amount of sun hours per day in your local area and which can generally be found from the local town hall or library. 2. What is the daily power consumption of your electrical loads and reducing this makes your system more efficient and cheaper. The sunlight is the sunlight and there is not a lot you can do to increase it. You could install a solar tracker which follows the rotation of the sun from sunrise to sunset, but these tend to be expensive. Lowering the electrical demand of your home can save you a lot of money in the long term as well as reducing the size of your solar array giving you a quicker payback period. But there are electrical loads that are NOT cost effective to power using solar energy as their consumption would be more than the solar array could supply. Any load that that requires electricity to generate heat such as water heating, space heating, cooking, air conditioning, etc. all these devices should be powered by other means. Heating water using the suns energy, called “Solar Thermal”, is possible and nowadays common place using flat plate solar collectors or evacuated tubes, but not photovoltaic panels. Alternative Energy Tutorials is dedicated to helping and showing you what you need to make Solar Power in your home a reality so you can save money on your utility bills, and to help you on your way consider Clicking Here and getting one of the solar books from Amazon about home made solar panel construction ensuring so that you have all the necessary information to get your solar power installation working efficiently and effectively the first time. Good luck! Since it takes a lot of energy to heat up water, it must follow that hot water (say at 70 deg Celsius) must be “storing” a lot of energy that could be turned into electricity. I am not talking about super-heated steam from under the earth – just normal hot water from solar panels mounted on roofs. How could this hot water be made to give up its energy and how to convert it into electricity ? what are the things i need to keep in mind before buying a solar panel except power, warranty, and efficiency rating?